SMS Hertha was a protected cruiser of the Victoria Louise class, built for the German Imperial Navy (Kaiserliche Marine) in the 1890s. Hertha was laid down at the AG Vulcan shipyard in 1895, launched in April 1897, and commissioned into the Navy in July 1898. The ship was armed with a battery of two 21 cm guns and eight 15 cm guns and had a top speed of 19 knots (35 km/h; 22 mph). Hertha served abroad in the German East Asia Squadron for the first six years of her career; she served briefly as the Squadron flagship in 1900. She contributed a landing party to the force that captured the Taku Forts during the Boxer Rebellion in 1900. After returning to Germany in 1905, she was modernized and used as a training ship in 1908, following the completion of the refit. She conducted a series of training cruises, and several notable officers served aboard the ship as cadets, including Karl Dönitz and Ernst Lindemann. At the outbreak of World War I, Hertha was mobilized into the 5th Scouting Group, but served in front-line duty only briefly. She was used as a barracks ship after 1915, and ultimately sold for scrapping in 1920. Hertha was 110.6 meters (363 ft) long overall and had a beam of 17.4 m (57 ft) and a draft of 6.58 m (21.6 ft) forward. She displaced 6,491 t (6,388 long tons; 7,155 short tons) at full combat load. Her propulsion system consisted of three vertical 4-cylinder triple expansion engines powered by twelve coal-fired Belleville boilers. Her engines provided a top speed of 19 kn (35 km/h; 22 mph) and a range of approximately 3,412 nautical miles (6,319 km; 3,926 mi) at 12 kn (22 km/h; 14 mph). She had a crew of 31 officers and 446 enlisted men. The ship was armed with two 21 cm SK L/40 guns in single turrets, one forward and one aft. The guns were supplied with 58 rounds of ammunition each. They had a range of 16,300 m (53,500 ft). Hertha also carried eight 15 cm SK L/40 guns. Four were mounted in turrets amidships and the other four were placed in casemates. These guns had a range of 13,700 m (44,900 ft). She also carried ten 8.8 cm SK L/35 naval guns. The gun armament was rounded out by machine guns. She was also equipped with three 45 cm (18 in) torpedo tubes with eight torpedoes, two launchers were mounted on the broadside and the third was in the bow, all below the waterline. Hertha was ordered under the contract name "K" and was laid down at the AG Vulcan shipyard in Stettin in 1895. She was launched on 14 April 1897, after which fitting-out work commenced. She was commissioned into the German navy on 23 July 1898. Hertha served as a colonial cruiser after she was completed, starting in 1899. After arriving on the East Asia station, she temporarily served as the flagship of Vice Admiral Felix von Bendemann, the commander of the East Asia Squadron, which included the cruisers Hansa, Gefion, Irene, and Kaiserin Augusta. After the new armored cruiser Fürst Bismarck reached the Asia station, she relieved Hertha as the Squadron flagship. As part of the East Asia Squadron during the Boxer Rebellion, the ship made a noteworthy contribution in the Battle of the Taku Forts. In June 1900, Hertha, along with Hansa, Gefion, and Irene landed detachments of Seebataillone (marines) to seize the Taku Forts. The marines joined detachments sent from warships of several other countries. A total of around 450 German troops were contributed to the multi-national force, which totaled around 2,200 officers and men. During the attack on the forts, Hertha's commanding officer was shot and killed. In September, Hertha carried Alfred von Waldersee to Shanghai, arriving on the 21st, where he took command of the international forces suppressing the rebellion. 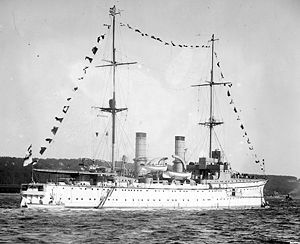 Hertha was detached from the East Asia Squadron and returned to Germany in 1905. In 1906, she went to dry dock at the Imperial Dockyard in Danzig for a refit, during which she was re-boilered. Hertha originally had three stacks, and during the modernization they were trunked into two funnels. The refit was finished by 1908, at which point Hertha became a cadet training ship; several prominent naval officers trained aboard the ship during this period. In September–October 1909, Hertha, Victoria Louise, Dresden, and Bremen traveled to the United States to represent Germany during the Hudson-Fulton Celebration. In 1910, Karl Dönitz, the future commander of the Kriegsmarine during World War II, served as a cadet on Hertha for a year. The ship cruised in the western Mediterranean in the autumn of 1912, along with her sister Vineta. The old cruiser Geier was also in the region. The future commander of the battleship Bismarck, Ernst Lindemann, served aboard the ship as a cadet in 1913. The ship conducted a training cruise in the Baltic and North Seas in late May to early July, stopping in a number of foreign ports, including Stockholm, Visby, and Bergen. The ship then embarked on a seven month training cruise into the Atlantic Ocean; during the voyage, Hertha called on numerous ports, including Vera Cruz, Mexico, Port-au-Prince, Haiti, Kingston, Jamaica, and Halifax, Canada. The cruise lasted from mid-August 1913 to mid-March 1914. Hertha had a short career during World War I. At the outbreak of hostilities, she was briefly mobilized into the 5th Scouting Group, which was tasked with training cadets in the Baltic Sea. By the end of 1914, however, the ships were again removed from service. She was then put into service as a coastal defense ship. After 1915, she was withdrawn from front-line duty again and employed as a barracks ship for the seaplane base in Flensburg. She was stricken from the naval register on 6 December 1919 and sold to ship-breakers in Audorf-Rendsburg. She was scrapped the following year. Blair, Clay (1996). Hitler's U-boat War: The Hunters, 1939–1942. New York, NY: Modern Library. ISBN 0679640320. Levine, Edward F.; Panetta, Roger (2009). Hudson–Fulton Celebration Of 1909. Charleston, SC: Arcadia Pub. ISBN 9780738562810. Mersey, Charles (1901). A Year in China, 1899–1900. New York, NY: Macmillan and co.
"Naval Notes". R.U.S.I. Journal. London: Royal United Services Institute for Defence Studies. XLIV: 684–699. 1900. doi:10.1080/03071840009420016. The Boxer Rising: A History of the Boxer Trouble in China. Shanghai: Shanghai Mercury, Ltd. 1901. Vego, Milan N. (1996). Austro-Hungarian Naval Policy, 1904–14. London: Frank Cass Publishers. ISBN 9780714642093.